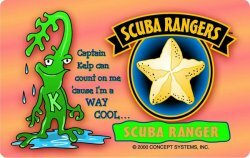 Scuba Rangers - Just for Fun! Learning to scuba dive is not just for the young at heart. Kids ages 8-12 can join Denver Divers’ Scuba Ranger program and dive in our heated salt water pool. Rangers use all the same gear as their parents – just scaled to size. And Rangers learn the same scuba skills, but learn them through fun, interactive games. Working their way through five Ranger levels, your kids earn a pool-only certification card with rewards for each Ranger level achieved along the way. 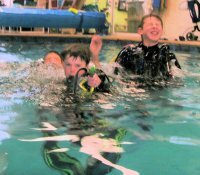 Initial Scuba Rangers training is offered through five or six separate classroom and pool sessions of about two hours each. 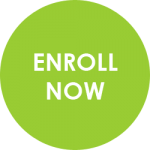 During the school year, classes are Thursday or Friday afternoon for five weeks. During the summer, Denver Divers hosts camps of about three hours over five afternoons. Class 1 – Red Rangers review swimming skills and learn how to snorkel with a mask, a snorkel and fins. Red Rangers learn surface rescue skills like fin push and cramp removal. Red Rangers also learn to free dive from the surface. Class 2 – White Rangers learn the reasons for each piece of dive equipment and begin equipment assembly. White Rangers use BCDs, regulators, fins, masks, and wetsuits all sized accurately to their smaller frames – a critical step toward comfortable diving. During the White Rangers class, Rangers wear their equipment on the ledge, learning how to breath underwater. Class 3 – Blue Rangers learn specific open water skills like regulator retrieval skills, mask-clearing, air-sharing, and taking off and putting on their BCDs underwater. Blue Rangers are expected to demonstrate neutral buoyancy through fin pivot, “buddha position,” and threading the obstacle course. Class 4 – Silver Rangers learn about marine life and ocean activities in the classroom. In the pool, Silver Rangers practice their skills to demonstrate to instructors, family members and friends. Class 5 – DEMO Rangers show off their skills to parents, other family members, and friends who can watch underwater on scuba or snorkeling gear. In the Denver Divers’ pool, your child will show you what he or she has learned. DEMO Rangers even graduate underwater! Make sure you stay for the party. This is a very fun graduation! Kids age 10-14 can become certified as a Junior Open Water Diver, and once they turn 15, your budding scuba enthusiast will now be a full Open Water Diver! And both Scuba Rangers graduates and Junior Open Water graduates can join us for our "Specialty Rangers" activities. 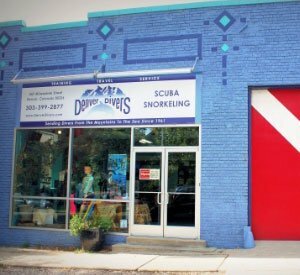 Ask a Denver Divers staff member about upcoming Scuba Rangers events!